Midwest Farmers Coopeartive awarded several grants to local FFA chapters for the 2018-2019 school year. We are proud to support these chapters and the young men and women that have an interest in agriculture. It is a small way that we can give back to the communities that support Midwest Farmers Cooperative and a way to support the future of agriculture. The chapters and projects are listed below. You can read the press release from the Nebraska FFA Foundation here. 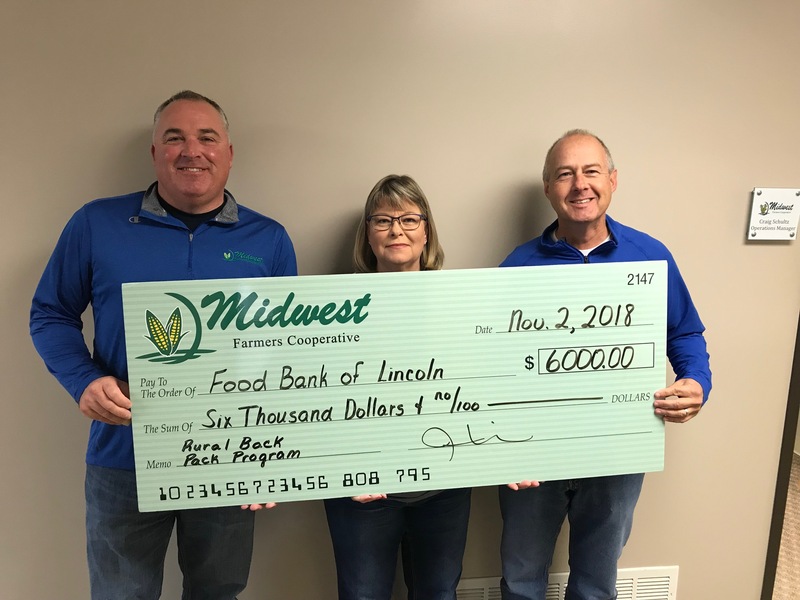 Midwest Farmers Cooperative teamed up with Land O'Lakes and CoBank to donate to the Rural Back Pack program with the Food Bank of Lincoln. One in five children in Nebraska under the age of 18 is at risk for hunger. This program provides back packs filled with healthy food for children of need to take home on Friday afternoons. This year the donation by Midwest Farmers Cooperative will go to children in Adams, Bennet-Palmyra, Elmwood-Murdock, HTRS, Norris, Pawnee City, Raymond Central, Syracuse, Tecumseh and Waverly. In honor of National FFA week February 17th-24th, we awarded several grants to local FFA chapters in partnership with Land O'Lakes and CoBank. We are proud to support these chapters and the young men and women that have an interest in agriculture. It is a small way that we can give back to the communities that support Midwest Farmers Cooperative and a way to support the future of agriculture. The capters are listed below. Click here for amounts and programs being funded. The Employee Advisory Group, EAG, honored employees for this past quarter through the Employee Excellence program. From a group of nominations received by the EAG from employees, Jeremy Wilhelm, CEO, announced five employees that received awards and recognized four other employees that received nominations. Congratulations and thank you for your dedication and service to MFC!